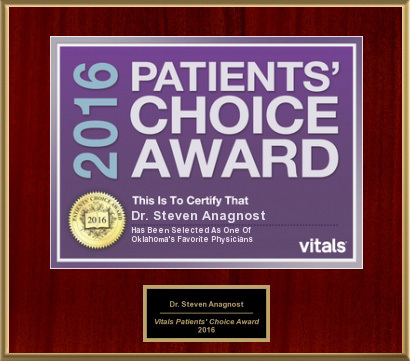 Editor’s Note: This is the latest installment in a series of exclusive investigative stories that focus on Dr. Steven Anagnost and his battle to retain his medical license while also trying to defend himself against allegations from the Oklahoma Medical Licensure Board, competing physicians and a group of medical malpractice attorneys in Tulsa. OKLAHOMA CITY – Embattled Tulsa spine surgeon Steven Anagnost recorded better post-operative statistics compared to national and local peers, according to an independent research report that focused on a five-year time period. The report, prepared by Oklahoma-based health care administrator and health policy researcher Michael Lapolla, centered its attention on complication and morbidity rates, length of hospital stays, costs and readmission rates from 2005 through 2009. Anagnost, a pioneer in Minimally Invasive Spine Surgery (MISS) was the target of the Oklahoma Medical Licensure and Supervision Board for several years as staff members and board members sought to revoke the surgeon’s medical license. Secret files and emails meant to ruin Anagnost were obtained by Red Dirt Report as part of an exhaustive investigation into the case that started in 2005. Prior to the medical board’s investigation, Anagnost turned down an offer from competing surgeons to join their practice at Oklahoma Spine and Brain Institute and the physician-owned Tulsa Spine & Specialty Hospital. Anagnost’s surgical practice had flourished because of the MISS procedure, taking patients away from other surgeons who used traditional spine surgery techniques that often resulted in longer hospital stays, higher readmission rates and continued pain. After Anagnost rejected OSBI’s offer, solicited lawsuits from medical board staffers and unsubstantiated complaints from the competing surgeons began piling up. The medical board’s investigation continued for five years despite an admonition from four Oklahoma Supreme Court justices that Anagnost’s due process rights may have been violated. Meanwhile, the Lapolla report clearly shows the allegations leveled against Anagnost were not true. According to the report, Anagnost’s patients experienced fewer complications than the national standard for each of the 17 quarters from the third quarter of 2005 through the third quarter of 2009. “These data demonstrate that Dr. Anagnost is practicing at a very high level compared to national peers and that his performance is not only consistent but also improving,” Lapolla wrote. Much of the information in Lapolla’s report was taken from the Hillcrest Healthcare System Physician Quality Measure Report for January 2005 through July 2009. Lapolla acknowledged he was paid by Anagnost to conduct the research and write the report but that his findings were not influenced by the surgeon or other outside parties. As part of the report, Anagnost also was compared to eight other Hillcrest surgeons, including Dr. Frank Tomacek, who was one of the key players in the complaints and lawsuits filed against Anagnost. Tomacek, a partner in OSBI, was an expert witness in nearly two dozen of the lawsuits. Anagnost’s stats also were compared to Drs. Clinton Baird, Christopher Covington, Steve Gaede, Eric Sherburne, John Main and Greg Wilson. Baird, Covington, Gaede and Sherburne also are partners in OSBI. Other metrics included length of hospital stays and hospitalization costs. Anagnost’s patients experienced hospital stays 45 percent better than the national standard while the length of stay for his local peer group was 16 percent below the national standard. Financially, Anagnost’s patients were better off. According to the report, his competing surgeons charged 25 percent less than the national norm while Anagnost was 32 lower than that same standard. A typical cost, including hospital charges, for a minimally invasive decompression would be about $5,000, Anagnost said. That type of surgery would be an outpatient procedure. Conversely, the cost for a traditional open spine surgery with instrumentation, including hospital stay, would be about $50,000, he said. “It is usually a factor of 10 times the cost for an outpatient minimally invasive procedure compared to a traditional open inpatient surgery such as a fusion,” Anagnost said. Lapolla, who has worked with the state medical board in the past, maintains his report was never accepted by the medical board. Anagnost claimed medical board Executive Director Lyle Kelsey and the Attorney General’s office tried to keep Lapolla’s report hidden from the public. Kelsey did not return telephone calls for comment in connection with this story. Anagnost believes the Lapolla report refutes all of the allegations leveled against him during the last five years. “The Oklahoma Medical Board attempted to line up all of my bad outcomes back to back, over my entire career, and falsely conclude that I am a bad doctor. This is completely illogical. No credible or competent agency would ever do this. Every doctor will have bad outcomes. The Oklahoma Medical Board refused to include the thousands and thousands of successful outcomes into my data,” he said.